The natural trend continues and the majority of exhibitors presented flavours, sweeteners, colours and fibers from natural sources. The consumers crave more natural, non GMO and non-artificial ingredients, which the food industry seems to take really seriously. A great example is the global Sustainable Trade Initiative, inspiring and helping companies to sign up for sustainable production. This really warms our hearts, as sustainable foods are better for both mankind and the environment. We believe younger generations will demand that all our foods are healthy for us and produced in a sustainable way. The food industry must do what it can to be transparent with ingredients and reduce the negative impact on the environment. Sugar reduction is still a very popular trend, with many companies presenting natural and healthier alternatives to sugar. The fast growing trend for healthier snacks and meals is probably influenced by consumers increasing health awareness and WHOs recommendation to drastically reduce the daily sugar intake. According to newly released information from the chocolate company Barry Callebaut, 49 percent of global consumers are trying to limit their sugar intake. The food and beverage industry is also affected by the threat of sugar taxes and therefore incentivised to reduce sugar. Major players such as Coke, Unilever and Nestlé have already set sugar reduction goals for their most popular products. Many suppliers had their formulation teams develop new solutions for sugar reduction and here we will see a multitude of clever solutions in the future. 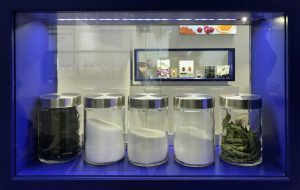 As some of the bulk effect disappears when switching from for example sugar to stevia, many suppliers sell combo solutions with both sweetener and bulk. Those solutions simplify the product formulation and we talked to some partners about similar collaborations. The market for ingredients that intensify and enhance existing sweetness is also growing, and it can be a great tool to complement stevia. 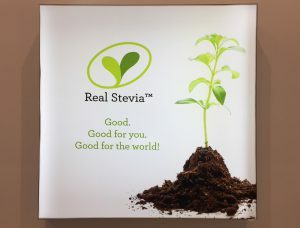 We enjoyed meeting many old and new customers and noticed that the knowledge and acceptance regarding stevia has increased significantly. Many partners are interested in developing new sugar reduced products and ingredients to attract the market. Of course they are also interested in our sustainability work and our collaboration with the farmers in Paraguay. At our booth we promoted information regarding the EU approval of stevia leaves, which opens a new market for teas and tea drinks without added sugar. In summary FIE was a great fair and we look forward to the next time!